If you'd like to make a wholesale or bulk order inquiry, please e-mail your name, phone number and e-mail address to sales@spytec.com. A sales representative will contact you shortly after. We have extremely competitive volume pricing. Do you ship outside of the United States? If so, what is the cost? We have various shipping methods available for almost every country on earth. To see the shipping methods and prices for your address please add a product to your shopping cart, go to the checkout page and enter your shipping address. What does my order come up as on my billing statement? On your bank / debit card billing statements, your order will be listed as being from “STI” along with the price of your order. It will not say “Spy Tec” or the product name anywhere on the bill. What does it say on my package when it arrives? The return address will say STI and will have our NY offices’ address. It will not say “Spy Tec” anywhere on the shipping box. You can find directions for properly formatting your microSD card by clicking here (http://forum.spytec.com/index.php?threads/how-do-i-format-a-64gb-sd-card.3/). Often videos won’t play properly on certain media players. One video player that we recommend (and is free!) is VLC. Click here to download it (http://www.videolan.org/vlc/download-windows.html). Visit our knowledge base (https://spytec.freshdesk.com/support/home) where we keep most of our user manuals. If you can’t find it there, write us a message below and we will see if we can find what you are looking for. Why does my SD card come with another part? This other part is an SD card adapter which allows you to fit your microSD card into SD card sized slots (like you may have on your computer). Simply fit the microSD card into the adapter and plug it in. 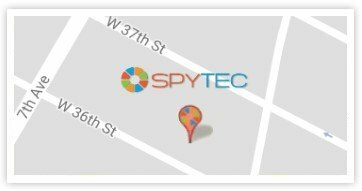 All spytec.com orders can be tracked at the following link (http://www.spytec.com/trackorder). If you are trying to track a Fedex, USPS or UPS shipment, you can simply copy and paste the tracking number directly into google’s search bar. If your order shipped DHL, you will need to visit http://www.dhl-usa.com/en.html to track your package. An order will ship out the same business day as long as the order is placed before 4:30PM EST. If an order comes in after 4:30PM EST or on the weekend, it will ship out the following business day. Ground shipments will take approximately 2-5 days within the US. 2nd Day and Next-day shipments will take two days and one day respectively. Please click here to see our return policy (http://www.spytec.com/return-policy/). Please fill out the return authorization (RMA) form (http://www.spytec.com/customer-return) and a customer service person will respond to you with instructions on how to proceed. Where can I find the RMA form? Please click here to find the RMA form (http://www.spytec.com/customer-return). After we’ve credited your account, it can take up to 48 hours before the refund will show on your credit card / bank statement. How can I avoid a restocking fee? We will only charge a restocking fee on a return if there are missing contents or a damaged box or unit. How do I activate my GPS tracker? Please fill out the following form (https://www.spytec.com/gps-activation) and we will e-mail you log-in credentials for your tracker. How do I deactivate my GPS tracker? Please click here to e-mail us about deactivating your GPS tracker. Are there activation and cancellation fee? There are no activation and cancellation fees of any kind. My tracker says it's in NEW Jersey but it isn't? My tracker says it is in New Jersey but it isn’t. Is it broken? Where should I place my tracker? The tracker can be hidden inside the car or placed under the car with the magnetic case (sold separately). It does not need to be in direct line-of-sight, but placing it in the glove box or inside the trunk would likely block or interfere with the cellular reception the device uses to transmit data. Most users place the device somewhere in the back seat area or purchase a magnetic case and place it underneath the trunk area (awayfrom the tailpipe). Why is my tracker not updating properly? What is the difference between a real-time tracker and a GPS logger? Real-time trackers allow you to monitor the location of the device at any time, on any platform. Typically it is done via a subscription based service. You then can log into the service via a computer, cellphone or tablet and view the location and other vital info about the tracker. Loggers are an alternative to the real-time platform. When using a logger you cannot access the information they collect while they are doing the tracking. As the name implies, they log the data, allowing you to view it after you have retrieved the device from the vehicle or whatever you may have been tracking. They will typically track for 10-30 days, and then they must be retrieved and connected to a PC in order to view the files. All real-time trackers require a monthly fee to compensate for the cost of the SIM data (like the data plans used by a smart phone) that is used by the trackers to communicate with our servers.